Two Hindi films, about 30 years apart. Both were shot in the same state of India. The names of the lead pair are the same. Also, the name of the male lead appears in the title of the first film. The lead actress of the first film played the role of the hero’s mother in the second. Also the narrator of both films is the same. 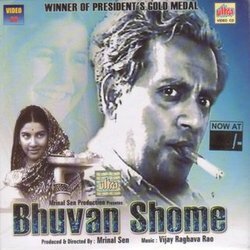 Watched Mrinal Sen’s ‘Bhuvan Shome’ today. There were merits in the film, telling the story of Bhuvan Shome sahab’s redemption. He is a middle-aged Railway Officer, a strict disciplinarian and a lonely widower leading a monotonous life. One day as he goes hunting, an encounter with a young woman brings about a subtle but important transition in him. He no more wants people to be scared of him. I loved that this graph of the story was not on-the-face but I thought the film itself was slightly over-indulgent. Also, the style was clearly inspired by the French New Wave and hence I can not give the film any credit for originality. By Hindi film standards, yes, it must have been an innovation, and an important film. However, I loved the young Suhasini Mulay – she was spontaneous, natural, and raw. She should have done more films and I think it is our loss that she didn’t, until recently. Well, today is the 10th Anniversary of the other film in question. I no more respect its makers as much as I did back then, but this film will remain special for me, and for Hindi cinema. wow! amazing :) and just yesterday i had thought of Lagaan. and now reading this post! First, I watched it with my father, who hates Hindi films and cricket (what a strange choice of companion to watch that particular film, you'll ask, but that's a different narrative). But he actually came away, well... not grumpy, saying he enjoyed the film and understood cricket a bit, finally. Second, it was an additional pin pulling together two very important relationships in my life. One of my dearest friends, Florian Stadtler, fell in love with the film and wrote a very well-received essay about it when we were together at the University of Kent, Canterbury (http://oro.open.ac.uk/26158/). It was one of the early things we spoke of (along with Rushdie) on bitterly cold dark evenings as our warm friendship grew. And then when I met my future husband and the first invitation back to his place happened, Lagaan was on his shelf to be spoken about with excitement and help in dissolving the ocean-wide cultural divide between two races. Third, my step daughter loved it when she was 9 or so and wanted to become a great cricketer so she could join the Indian team and help beat the English (again)!! Sorry, I went on a bit there. But it was heartening to know these stories about Lagaan. Do not hesitate while posting a comment here. I get a lot to speak and don't mind reading a bit from my 'followers'!